Behold my barkcloth skirt! I wanted to make a relatively simple garment to show off the lovely retro fabric design as much as possible, so decided on a vintage pattern from the 1950's. The pattern is Simplicity 3983 which has just the one seam going up the back, so no worrying about pattern matching side seams. As you can see, I didn't make much of an effort to match the shaped pockets and front waistband either. I don't care though, it looks fine! Having already made this skirt once before, I only made one pattern change, which was to shorten the length by an inch (I'd already taken a gigantic eight inches off the original pattern). I also made a few changes to the construction. I replaced the centred zip with an invisible one and added a faced waistband instead of a Petersham ribbon facing, which is how I finished the waistband on my first version. I also positioned the zip so that it runs through the waistband (like you find on the Delphine and Ginger skirt patterns). I know some people like a waistband starting above the zip, but I personally prefer them integrated. It's not authentically vintage but I like how it looks. I added a white silk-cotton lining using this method, and used some scraps of cotton lawn for the pockets. - The feel of barkcloth is quite rough against the skin, so if you're planning on using it for garment making, I'd advise underlining with a very light fabric or adding a separate lining. - Barkcloth has quite a loose weave and is liable to stretch slightly when cut on the bias. This happened with my curved front pocket facings, but it actually turned out in my favour as they now allow a bit more room to get my hands in! Just be careful to staystitch any curved edges and try not to over stretch when pressing. - The fabric frays and unravels quite noticeably, so I ended up overlocking all raw edges quite early on in the proceedings. Apart from that it didn't behave any differently from a linen or cotton. I used a regular needle in my machine and it sewed together beautifully. Even though I knew the fabric was brand spanking new, I still felt like I was working with a piece of 1950's barkcloth, it just looks vintage! I'm delighted with the finished skirt - it's contemporary but the fabric gives it a vintage edge, which is my favourite combination! I've paired it with a jumper for these pictures because it's still cold and I'm a wuss, but I can totally see it working with this, this, this and even this!! The fabric is lovely and the skirt looks great. i really love this. must get my hands on some of that fabric! Love this, what a great pattern and the fabric is lovely. I love this fabric and I love this skirt. May need to copy soon! I'm a very, very, very inexperienced dressmaker, so bear with me. Is there any reason I couldn't take the simple A-line skirt pattern I've already perfected and tape the pattern pieces together so it's essentially the same as this skirt minus the pockets? Is this a thing people do? Except, how is this skirt shaped at the side hip if it's only one piece? Are there darts there? The fabric is lovely and it’s a beautiful match with the pattern. I'm intrigued by the one piece pattern - very economical on fabric, I should think. It looks beautiful. I think a basic pencil skirt would be a good starting point to make the one piece, with a bit A shaping to the sides first and then transferring the existing darts and the side seam shaping as a new dart. Might have to try it as I have the perfect piece of fabric that might just be enough. Thank you for the inspiration. Love your Brucie bonus skirt :-) The pattern shows off the fabric beautifully and it's such a lovely, Spring colour too. Beautiful skirt. It's totally your style and works well with the blouses you've made. I have my eye on that range too. What a lovely skirt! There are definitely many ways it can be worn. I am intrigued by the pattern, as it has no side seams. Fab skirt. Love the pattern and the pockets on the front give it such a vintage feel. I've got a bit of bark cloth at home myself but I've been to scared to cut into it yet. Your advice has speed me on. Thanks Jane. I have been following your sewing blog for several years, but I can't for the life of me remember the red polka dot skirt! I love this skirt, the pattern, and that it falls beautifully on your body. Nicely done! I need to buy some bark cloth. Gawd, I love that print!! Very nice skirt, and I will try your version of zip/waist band combo. Up until now, I've always made an overlapping waistband with hooks and bars, but it is extra work and really not always that neat-looking. Thanks for the tip! Lovely skirt, and the fabric works really well with the pattern. The single pattern piece (not counting the pockets...) has me very tickled and I hope you won't mind that I've just purchased a copy of S3983 for myself from etsy! It wasn't remotely my size but I figure it must be one of the easiest ones to grade up (assuming it's a case of getting the width right, then placing the pockets accordingly!). 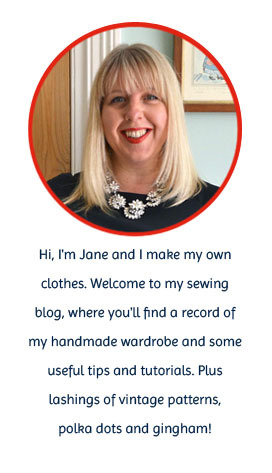 Wonderful fabric choice, Jane, and beautifully sewn up! Looks great, and I love the fabric. What a great print! It's very cool!!!!! Your skirt looks lovely! I have this skirt pattern and have made it up once before. I'd like to sew it up again using some of the modifications you mentioned in this post, notably the zipper in the waistband and the lining. Thanks for the tips and links! Just wondering where you got the pattern? I can't seem to locate it here in NZ or overseas.